update on where we are at this time. 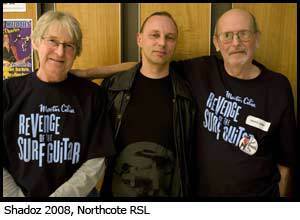 Geoff with John Hall & Martin Cilia. visit Geoff whilst he was in hospital and he wished us every success for this year’s event. Our sincere condolences to Geoff’s family at this time. On to other items, again the response to bands/performers has been outstanding however, due to unforeseen circumstances Kim Humphreys will not be with us. He wishes us all the very best for the day and certainly would like to be with us. Kim passed on a copy of his latest CD which we will play during the afternoon, great sounds from a great guitarist. The Knox Club is located on Cnr Stud & Borinia Roads, Wantirns South, ph: 9801 6466. We commence early afternoon through to early evening, final time dependant on audience and performers participation. Bar meals and service is provided by The Club, bar meals are inexpensive and for those wishing to dine with family and friends, the Club Bistro (McLuskey’s Bistro) is available with excellent service and meals. Plenty of parking and ease of access for those not ambulatory as others via a ramp. For performers, a full back line up with is provided including a sound system with sound engineer (Courtesy of Con Anag), Drum Kit (Courtesy of Gerry Halpern), Guitar Amplifiers (Courtesy of Warriors Victoria, www.warriorsvictoria.com). an interest in setting up such a stall, please contact the writer. Note that donations etc are to Geoff’s Family to assist in funeral arrangements and other areas of Geoff’s estate, entrance is free to this years event.